part 2: Late Summer Tour of North America. G. E. Smith (guitar), Kenny Aaronson (bass), Christopher Parker (drums). 7-9 and 13 Bob Dylan (vocal & guitar), G.E. Smith (guitar). 1,11 G. E. Smith (backup vocal). 6 G. E. Smith (electric slide guitar). Stereo audience recording, 75 minutes. Session info updated 12 October 2011. Concert # 42 of The Never-Ending Tour. Second concert of the Interstate 88 Tour, part 2: Late Summer Tour of North America. Concert # 42 with the first Never-Ending Tour Band: Bob Dylan (vocal & guitar), G. E. Smith (guitar), Kenny Aaronson (bass), Christopher Parker (drums). 7-10 and 14 Bob Dylan (vocal & guitar), G.E. Smith (guitar). 1, 12 G. E. Smith (backup vocal). 5 G. E. Smith (electric slide guitar). 6 new songs (40%) compared to previous concert. 6 new songs for this tour. Stereo audience recording, 85 minutes. Session info updated 15 October 1993. Concert # 43 of The Never-Ending Tour. Third concert of the Interstate 88 Tour, part 2: Late Summer Tour of North America. Concert # 43 with the first Never-Ending Tour Band: Bob Dylan (vocal & guitar), G. E. Smith (guitar), Kenny Aaronson (bass), Christopher Parker (drums). 1, 11 G. E. Smith (backup vocal). 16 Tracy Chapman (shared vocal). 10 new songs (62%) compared to previous concert. 9 new songs for this tour. Stereo audience recording, 80 minutes. Concert # 44 of The Never-Ending Tour. Concert # 4 of the Interstate 88 Tour, part 2: Late Summer Tour of North America. Concert # 44 with the first Never-Ending Tour Band: Bob Dylan (vocal & guitar), G. E. Smith (guitar), Kenny Aaronson (bass), Christopher Parker (drums). 7-11 and 15 Bob Dylan (vocal & guitar), G.E. Smith (guitar). 1, 3. 13 G. E. Smith (backup vocal). 17 Tracy Chapman (shared vocal). 12 new songs (70%) compared to previous concert. 6 new songs for this tour. Stereo audience recording, 90 minutes. Session info updated 6 September 2013. Concert # 45 of The Never-Ending Tour. Concert # 5 of the Interstate 88 Tour, part 2: Late Summer Tour of North America. Concert # 45 with the first Never-Ending Tour Band: Bob Dylan (vocal & guitar), G. E. Smith (guitar), Kenny Aaronson (bass), Christopher Parker (drums). 1,10 G. E. Smith (backup vocal). 15 Tracy Chapman (shared vocal). 16 Doug Sahm (lead vocal). Thank you, that was Doug Sahm! (after She's About a Mover). 6 new songs (37%) compared to previous concert. 1 new song for this tour. Concert # 46 of The Never-Ending Tour. Concert # 6 of the Interstate 88 Tour, part 2: Late Summer Tour of North America. Concert # 46 with the first Never-Ending Tour Band: Bob Dylan (vocal & guitar), G. E. Smith (guitar), Kenny Aaronson (bass), Christopher Parker (drums). 1, 5, 12 G. E. Smith (backup vocal). 3 G. E. Smith (electric slide guitar). 6 new songs (40%) compared to previous concert. 2 new songs for this tour. Concert # 47 of The Never-Ending Tour. Concert # 7 of the Interstate 88 Tour, part 2: Late Summer Tour of North America. Concert # 47 with the first Never-Ending Tour Band: Bob Dylan (vocal & guitar), G. E. Smith (guitar), Kenny Aaronson (bass), Christopher Parker (drums). 10 new songs (62%) compared to previous concert. No new songs for this tour. Concert # 48 of The Never-Ending Tour. Concert # 8 of the Interstate 88 Tour, part 2: Late Summer Tour of North America. Concert # 48 with the first Never-Ending Tour Band: Bob Dylan (vocal & guitar), G. E. Smith (guitar), Kenny Aaronson (bass), Christopher Parker (drums). 7-10 and 14-15 Bob Dylan (vocal & guitar), G.E. Smith (guitar). Thank you. (after All Along The Watchtower). 6 new songs (37%) compared to previous concert. 2 new songs for this tour. Concert # 49 of The Never-Ending Tour. Concert # 9 of the Interstate 88 Tour, part 2: Late Summer Tour of North America. Concert # 49 with the first Never-Ending Tour Band: Bob Dylan (vocal & guitar), G. E. Smith (guitar), Kenny Aaronson (bass), Christopher Parker (drums). 8 new songs (47%) compared to previous concert. 3 new songs for this tour. Concert # 50 of The Never-Ending Tour. Concert # 10 of the Interstate 88 Tour, part 2: Late Summer Tour of North America. Concert # 50 with the first Never-Ending Tour Band: Bob Dylan (vocal & guitar), G. E. Smith (guitar), Kenny Aaronson (bass), Christopher Parker (drums). First of three electric versions of Visions Of Johanna during Never-Ending Tour (as of rev. date). Only acoustic performance of I Don't Believe You during Never-Ending Tour (as of rev. date). 9 new songs (60%) compared to previous concert. 3 new songs for this tour. Session info updated 22 August 2000..
Concert # 51 of The Never-Ending Tour. Concert # 11 of the Interstate 88 Tour, part 2: Late Summer Tour of North America. Concert # 51 with the first Never-Ending Tour Band: Bob Dylan (vocal & guitar), G. E. Smith (guitar), Kenny Aaronson (bass), Christopher Parker (drums). 1, 9, 12 G.E. Smith (back-up vocal). Note. Three songs from Down In The Groove! 10 new songs (58%) compared to previous concert. 3 new songs for this tour. Stereo PA recording, 80 minutes. Concert # 52 of The Never-Ending Tour. Concert # 12 of the Interstate 88 Tour, part 2: Late Summer Tour of North America. Concert # 52 with the first Never-Ending Tour Band: Bob Dylan (vocal & guitar), G. E. Smith (guitar), Kenny Aaronson (bass), Christopher Parker (drums). 1. 11 G. E. Smith (backup vocal). Thank you! (after Ballad Of A Thin Man). 4 new songs (26%) compared to previous concert. No new songs for this tour. Concert # 53 of The Never-Ending Tour. Concert # 13 of the Interstate 88 Tour, part 2: Late Summer Tour of North America. Concert # 53 with the first Never-Ending Tour Band: Bob Dylan (vocal & guitar), G. E. Smith (guitar), Kenny Aaronson (bass), Christopher Parker (drums). 10 new songs (62%) compared to previous concert. 1 new song for this tour. Session info updated 22 August 2000. Concert # 54 of The Never-Ending Tour. Concert # 14 of the Interstate 88 Tour, part 2: Late Summer Tour of North America. Concert # 54 with the first Never-Ending Tour Band: Bob Dylan (vocal & guitar), G. E. Smith (guitar), Kenny Aaronson (bass), Christopher Parker (drums). 6 new songs (35%) compared to previous concert. No new songs for this tour. Session info updated 10 November 2016. Concert # 55 of The Never-Ending Tour. Concert # 15 of the Interstate 88 Tour, part 2: Late Summer Tour of North America. Concert # 55 with the first Never-Ending Tour Band: Bob Dylan (vocal & guitar), G. E. Smith (guitar), Kenny Aaronson (bass), Christopher Parker (drums). 1. 12 G. E. Smith (backup vocal). 4 new songs (25%) compared to previous concert. No new songs for this tour. Concert # 56 of The Never-Ending Tour. Concert # 16 of the Interstate 88 Tour, part 2: Late Summer Tour of North America. Concert # 56 with the first Never-Ending Tour Band: Bob Dylan (vocal & guitar), G. E. Smith (guitar), Kenny Aaronson (bass), Christopher Parker (drums). 8-10 and 15 Bob Dylan (vocal & guitar), G.E. Smith (guitar). 11 starts acoustic and ends electric. 1, 13 G. E. Smith (backup vocal). 7 G. E. Smith (electric slide guitar). Note. First acoustic to electric performance during Never-Ending Tour. 8 new songs (47%) compared to previous concert. 2 new songs for this tour. Concert # 57 of The Never-Ending Tour. Concert # 17 of the Interstate 88 Tour, part 2: Late Summer Tour of North America. Concert # 57 with the first Never-Ending Tour Band: Bob Dylan (vocal & guitar), G. E. Smith (guitar), Kenny Aaronson (bass), Christopher Parker (drums). 7-9 and 13-14 Bob Dylan (vocal & guitar), G.E. Smith (guitar). 1, 10 G. E. Smith (backup vocal). Thank you. (after Maggie's Farm). 7 new songs (43%) compared to previous concert. No new songs for this tour. Concert # 58 of The Never-Ending Tour. Concert # 18 of the Interstate 88 Tour, part 2: Late Summer Tour of North America. Concert # 58 with the first Never-Ending Tour Band: Bob Dylan (vocal & guitar), G. E. Smith (guitar), Kenny Aaronson (bass), Christopher Parker (drums). 14 starts acoustic and ends electric. Thank you. (after Stuck Inside Of Mobile With The Memphis Blues Again). Thank you. (after Like A Rolling Stone). 8 new songs (53%) compared to previous concert. 1 new song for this tour. Session info updated 1 February 1994. Concert # 59 of The Never-Ending Tour. Concert # 19 of the Interstate 88 Tour, part 2: Late Summer Tour of North America. Concert # 59 with the first Never-Ending Tour Band: Bob Dylan (vocal & guitar), G. E. Smith (guitar), Kenny Aaronson (bass), Christopher Parker (drums). 15 starts acoustic and ends electric. 1, 6 G. E. Smith (backup vocal). 10 new songs (62%) compared to previous concert. 2 new songs for this tour. Concert # 60 of The Never-Ending Tour. Concert # 20 of the Interstate 88 Tour, part 2: Late Summer Tour of North America. Concert # 60 with the first Never-Ending Tour Band: Bob Dylan (vocal & guitar), G. E. Smith (guitar), Kenny Aaronson (bass), Christopher Parker (drums). Thank you. (after I'll Remember You). 7 new songs (46%) compared to previous concert. No new songs for this tour. Concert # 61 of The Never-Ending Tour. Concert # 21 of the Interstate 88 Tour, part 2: Late Summer Tour of North America. Concert # 61 with the first Never-Ending Tour Band: Bob Dylan (vocal & guitar), G. E. Smith (guitar), Kenny Aaronson (bass), Christopher Parker (drums). Thank you. (after It's All Over Now, Baby Blue). Thank you. (after I Shall Be Released). 8 new songs (50%) compared to previous concert. No new songs for this tour. Concert # 62 of The Never-Ending Tour. Concert # 22 of the Interstate 88 Tour, part 2: Late Summer Tour of North America. Concert # 62 with the first Never-Ending Tour Band: Bob Dylan (vocal & guitar), G. E. Smith (guitar), Kenny Aaronson (bass), Christopher Parker (drums). Thank you. (after It Ain't Me, Babe). 6 new songs (40%) compared to previous concert. No new songs for this tour. Concert # 63 of The Never-Ending Tour. Concert # 23 of the Interstate 88 Tour, part 2: Late Summer Tour of North America. Concert # 63 with the first Never-Ending Tour Band: Bob Dylan (vocal & guitar), G. E. Smith (guitar), Kenny Aaronson (bass), Christopher Parker (drums). Concert # 64 of The Never-Ending Tour. Concert # 24 of the Interstate 88 Tour, part 2: Late Summer Tour of North America. 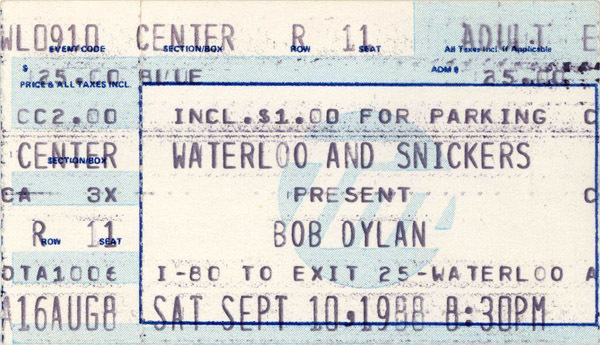 Concert # 64 with the first Never-Ending Tour Band: Bob Dylan (vocal & guitar), G. E. Smith (guitar), Kenny Aaronson (bass), Christopher Parker (drums). Thank you. (after Ballad Of A Thin Man). Concert # 65 of The Never-Ending Tour. Concert # 25 of the Interstate 88 Tour, part 2: Late Summer Tour of North America. Concert # 65 with the first Never-Ending Tour Band: Bob Dylan (vocal & guitar), G. E. Smith (guitar), Kenny Aaronson (bass), Christopher Parker (drums). Thank you. (after Barbara Allen ). 6 new songs (35%) compared to previous concert. 1 new song for this tour.